The purpose of this lab is to give you a chance to use some of the data stream tools we have been discussing in a simple application. 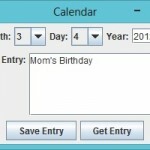 The assignment is to write a calendar application which allows the user to select a date, and either retrieve a previously stored calendar entry, or save a calendar entry. 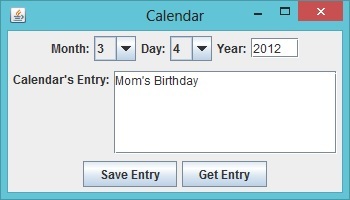 Your program should present a GUI interface which allows the user to specify the month, day, and year of the calendar entry. The GUI should also have a text area for displaying and editing a particular entry. It will also need two buttons, one for saving an entry, and the other for retrieving an entry. 1. Your user interface must allow the user to enter the month, day, and year. You can do this using text fields for input, or you can use ComboBoxes if you feel adventurous. 2. The only GUI components which create events that your program needs to handle are the save and retrieve buttons. 3. Don’t go overboard making your GUI beautiful! We are just looking for basic functionality here! 4. You must have a separate class which manages the calendar data. You will have a minimum of three classes in your application, a user interface class, the calendar manager class, and a calendar test class. The user interface class creates an instance of the calendar manager in its constructor and stores it in a member variable. 5. The calendar manager must provide methods which support saving a specific calendar entry and retrieving a specific calendar entry. The interfaces must be defined to only pass a single day’s calendar entry across the interface. 6. The calendar manager must store calendar data into files according to month+year. That is, the calendar entries for December 2011 must all be stored in the same file. 7. The calendar manager must use ObjectInput/OutputStreams to read/write data from/to files. The calendar manager will use an array to store String objects. The position of a String in this array corresponds to the calendar entry for a specific day. 8. The save method of the calendar manager will need to determine if a file exists for the requested month and year. If so, the object from that file must be read into the calendar manager. Otherwise, the calendar manager must create an empty String array. The new entry must be saved to the appropriate day’s location in the array. The modified array must be saved to the appropriate file. 9. The retrieve method of the calendar manager will need to determine if a file exists for the requested month and year. If not, return an error string indicating that there is no such entry. If the file exists, read the String array from the file and locate the requested day’s entry. If this entry is null, return an error string indicating that there is no such entry, otherwise return the entry. Take screen shots of the output of your program. Paste the screen shots and your source code for your programs into a Word document. Submit your Word document. exists, and if it doesn’t, use the mkdir method on the file object to create it. member variable. Close the streams. specified by the month and year. Create a FileOutputStream object using the base directory, month, and year. Create an ObjectOutputStream object on top of the file output stream. Close the object stream and the file stream object. If everything goes well, return a string indicating success. If there was an exception, return a string indicating an error occurred. Set the size of the GUI, and make it visible.